Selkirk RFC has kindly donated a spare metal scoop stretcher to fellow Tennent’s National League One side Marr RFC. 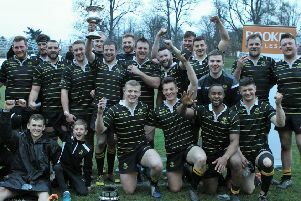 The presentation took place on the day Selkirk ventured west to play the Troon side, earning an excellent battling 17-17 draw. The apparatus hasn’t been used at Selkirk for some time, as the Souters have a newer plastic scoop. However, after Marr doctor Emma Lunan had contacted Selkirk club doctor Jeff Cullen for some advice on medical equipment, it seemed sensible, and in the interests of player welfare, to donate the unused stretcher to Marr RFC. The scoop stretcher is invaluable in transferring an injured player to either a spinal board or vacuum mattress for transport off the field. Pictured, from left (by Grant Kinghorn), are John Watt (Selkirk physiotherapist), Tom Ramage (Selkirk 1st XV manager), Dr Emma Lunan (Marr RFC), Katie Craig (Marr RFC physiotherapist) and Katy Lowthian (Selkirk RFC sports therapist).